In the California High Desert there are a group of roads that take you on a journey of discovery. A typical fast desert road winds North and begins to climb into a valley surrounded by giant windmills. Further on, countless Joshua trees increase in number as you make a steady 1,400 foot climb out of the valley floor. Turning West you begin the ascent up a mountainside. Narrow switchbacks and tighter turns slow your progress as you climb more than 3,000 feet into the forest. The air is noticeably cooler and thinner as you pick your way through the woods. The trees now have large trunks, and you catch glimpses of the skyline through them. 7,000 feet above sea level, racing a rally car in the woods 2.5 hours from Los Angeles. The best rally roads in California are the setting for the 2015 High Desert Trails Performance Rally! The top teams this year are a ‘who’s who’ of championship winners. 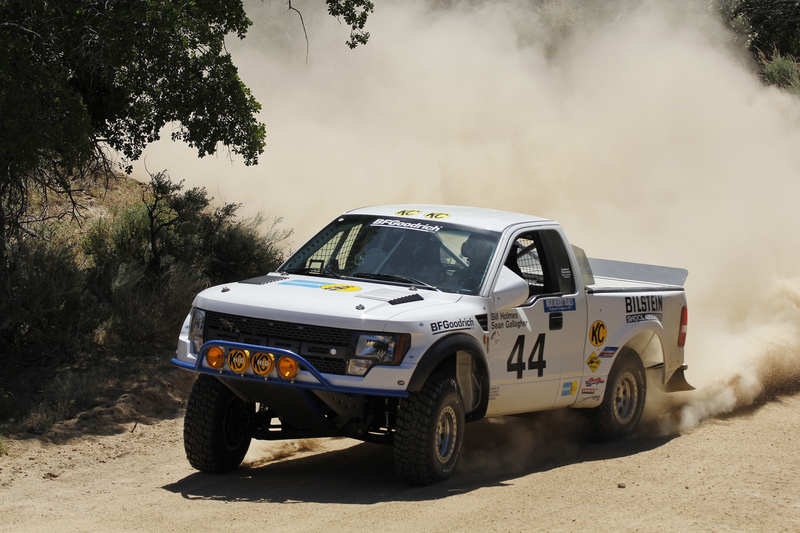 Bill Holmes and Sean Gallagher have won this event several times in the past with their 2WD Ford Raptor, but that didn’t include miles of twisty forest stages over the top of Sorrell Peak. 2014 Pacific Rally Cup AWD Champions John Trucks and Chris Fine have seen these roads in their Subaru STi, and will be looking to launch their 2015 points race for the cup. Don’t expect them to coast during the power stage, these guys will be flat out for the win. The winners of last year’s event including taking home $200 of Pirelli Tires from Streetwise Motorsports – Todd McAllister and Trent Bateman will be setting a winning pace in their Subaru WRX STi. All three teams need to watch out for Duncan Smith – a driver that set top times at Prescott last season in his Subaru. The 2WD pack will no doubt have it’s work cut out trying to catch Bill Holmes. The big question is: Will they be able to make up enough on the twisty stages? An 11 mile stage with a 40MPH average is a lot of work in a big truck, and a team like Markus and Alicia Saarinen in their well prepped Mini Cooper could be the ones to do it. This will be their first time at HDT, but they are well seasoned Southwest rally competitors. Look to see Pete Pollard and Seri Traver in the mix as Pete was the 2013 HDT Power Stage winner in his Honda Civic. The last stage of the rally kicks up the excitement by reversing the order and sends out the fastest teams last. No one knows for sure who’s won it until the last racer crosses the finish line on a gorgeous 15 mile downhill stage. 2WD and 4WD Power Stage Winners get $200 towards new Pirelli Tires from Streetwise Motorsports. Do you save your equipment and go for championship points? Do you push for the rally win? Or do you put it all on the line for the Power Stage? High Desert Trails is round 1 the 5 event California Rally Series 2015 season! The event is also part of a 3 rally series for the Pacific Rally Cup. Included in the PRC this year is the Idaho Rally International sponsored by Larry H. Miller Subaru on June 13-14, and the Prescott Rally supported by Guidance Aviation and Lamb Nissan in Arizona October 2-3. 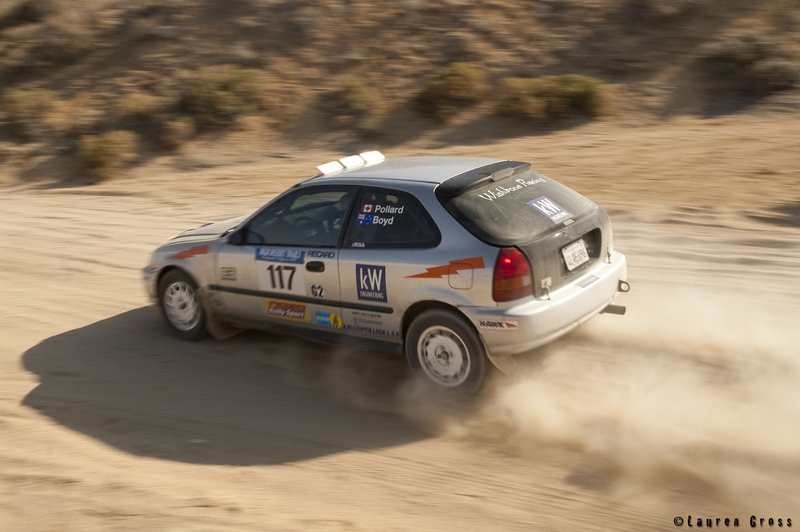 All three events will qualify teams for the 2015 NASA National Rally Championship. Teams qualify by winning the power stage in 2WD or AWD, or getting on the 2WD or AWD podium (1st-3rd). This run-off, winner-take-all, finale event will be held in the West this year at the Prescott Rally. It all starts Friday night at the SpringHill Suites in downtown Ridgecrest. The cars will be on display in Parc Expose` from 6:30PM to 7:30PM and there are spectator opportunities on Saturday afternoon. Sunday includes a rallycross at the fairgrounds. We’re looking forward to running an outstanding event – see you on the stages!